As we have reported earlier, through this website as well as Pensioners Patrika, in 7 Circles including Kerala, MP, Chhatisgarh, Orissa, Rajasthan etc. the concerned CCAs refused to count the extra increment granted to Grade III officials one year before their retirement as PAY while the pension was fixed. 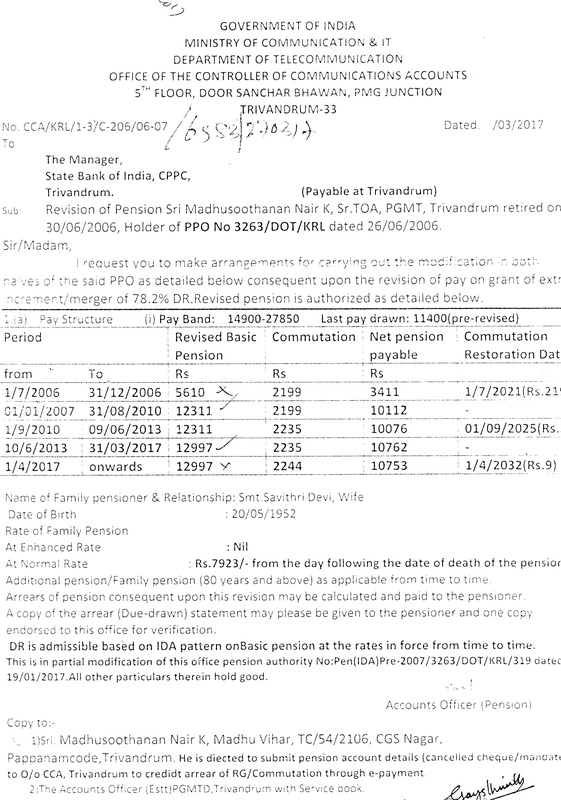 In most of the Circles it was treated as pay and pension was granted with the said increment. In Kerala, our Circle Association along with five retired BSNL employees who got the extra increment approached the CAT. On 15th March 2012, the CAT ord ered that the said extra increment should be treated as Pay even if the pay had crossed maximum of the pay scale. CCA did not honour the CAT verdict. He filed Appeal in the High Court. The High Court upheld the CAT verdict. Then, CCA granted the benefit only to the five pensioners who were Applicants in the Case. Our Association demanded that since Association is the applicant 1 in the case the benefit should be given to others placed in similar situation. After lot of delay the CCA is now issuing orders refixing the pension counting the extra Increment also. Copy of one of such orders is given below. I suggest that in other Circles, the affected Members can apply to the concerned CCA to refix their pension taking into account the Extra Increment granted by BSNL. Please Note: Those who did not get the Extra Increment before retirement, can not claim it now, whatever be the reason for not getting it. Affected pensioners can represent to respective CCAs for the benefit. It is reliably learnt that BSNL Corporate Office Management Committee has approved to give medical Allowance to RETIREES for 6 months on experimental basis. Orders may be issued very soon. Dept. of Public Enterprises has issued orders fixing the rate of IDA from April 2017. It is 117.1% only. There is a reduction of 2.4% from the existing rate of 119.5% applicable from January 2017. As per the calculations given in the order the IDA should bed 117.15%. 0.05% is ignored.